What better way to promote your message than through the product itself. 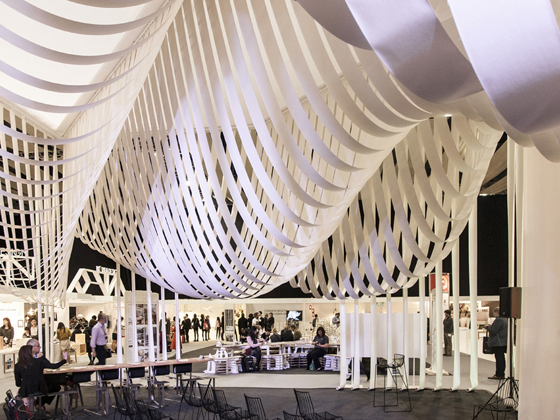 At the 2013 London Design Festival, design firms Studio Glowacka and Maria Fulford Architects utilized undulating paper as a showcase in the Paper Space auditorium. This temporary ceiling is made up of 1500 meters of white A4 paper! The bright whiteness of the paper allows it to catch lighting from the adjacent exhibits, creating a chameleon quality of color. Not only does the paper create an artistic ceiling, but it also drops to the floor along the perimeter, promoting attendees to tear off pieces of the paper- “Paper is a blank canvas for communication and a receiver for ideas,” Maria Fulford said. Looking at the nature of the design, it is fascinating to learn that the material utilized is paper, with the smooth, crisp lines and precise undulations. And what a perfect showcase for the message! A cool aspect of the design is the available options in terms of construction. What if a non-woven material were used? Similar characteristics to paper, but a different texture and wide assortment of available colors. Or maybe a fabric with a stiffer hand. This again would allow for various textures and colors. There are so many ways to showcase a message, while dressing the personality of a brand.